Following an almost two-hour public hearing, with no deliberation, Elk Grove Water District board of directors, which is under the auspices of the Florin Resources Conservation District, approved a rate hike that will be implemented over the next five years. The 4 - 0 (Director Jeanne Sabin was absent) vote came after several ratepayers voiced opposition to the increase. According to a rate study by Shawn Koorn of Seattle-based HDR Engineering, residential ratepayers will pay about three percent more annually on their base for three years starting in 2020. Although the base rate will fall for some residential customers for the next two years, the usage rate will increase starting this year. Monthly residential base rates will go from the current $66.67 per month to $61.15. However, the cost per hundred cubic feet (CCF) will increase for customers using 30 CCF per month, or less will increase from $1.57 to $1.92 this year, or about 22-percent and rise to $2.10 per CCF in 2022. Larger residential water users, those over 30 CCF per month will see their usage rate jump immediately from $3.11 to $4.04, for an increase of 30-percent. Over the next five years, CCF rates above 30 CCF per month will increase to $4.42 (see rate chart below). During public comment, directors heard a variety of concerns ranging from the process for protesting the rate increase to the quality of the district's water. Typical of the criticism was from Elk Grove resident Eric Veerkamp who was one of only 11 out of 12,600 ratepayers who filed a letter of protest on the proposed rate hikes and said if people were asked if they favored the increase, most would not be in support. "When I saw the flyer in the mail, I thought it was the beginning of the process," Veerkamp said. "I don't remember hearing about the public process and any community participation, and I wish I had." 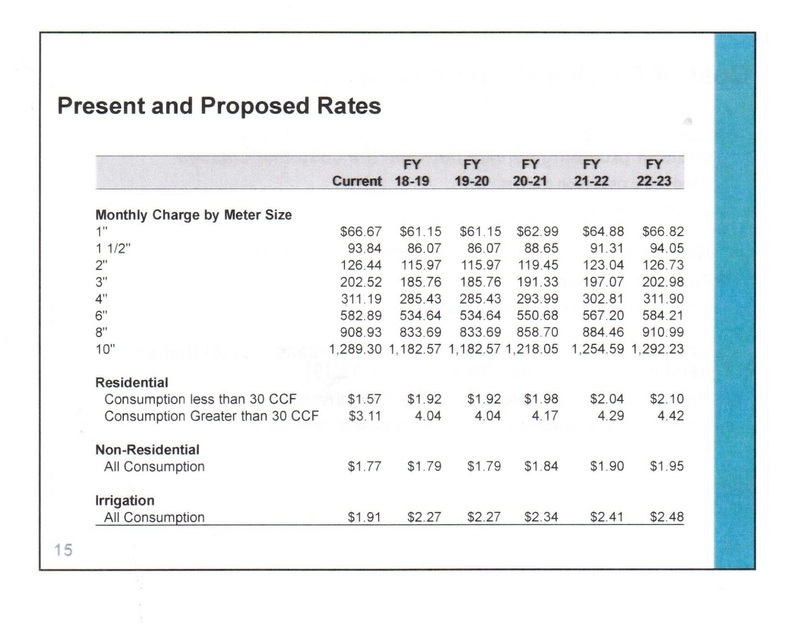 Reading portions of his protest letter, Veerkamp added he did not believe the rate structure did enough to encourage water conservation and the district does not sufficiently track ratepayers usage. He also commented he thought the process was not open and fair. "The accountability and transparency of the Elk Grove Water District seem questionable," he noted. The topic of the directors voting themselves a comprehensive health benefits package during their February 2018 regular meeting was also discussed. District manager Mark Madison noted that while the directors unanimously approved their own benefits package, he stated it has not yet been adopted. It was also noted during the public comment by the district staff that had over 50-percent plus one of the ratepayers sent letters of protest, the board of directors would not have been able to vote for the rate increase under Proposition 218. For purposes of Proposition 218, a protest letter would have signified a vote against giving the board of directors the ability to vote on the rate. When asked during an open exchange between members of the public, directors, and the district staff if the letter to ratepayers explained a protest letter was described as a vote against granting the board the authority, Madison and staff attorney Richard Nosky acknowledged that is was not expressed in that manner. "We have followed Proposition 218 in strict accordance to the law," Madison said during the hearing.